While Honors students are in class learning, and prospective students are on tour, five dispatchers are answering calls and monitoring the campus in the basement of Centennial Hall. The GSUPD call center moved from their cramped, narrow home at the base of the University Commons to beneath 100 Auburn Ave. back in December. The cost of the new facility, which sits at $1.5 million, may seem excessive, but according to Georgia State’s acting Interim 911 Communications Director Angelia Jennings, that’s just a drop in the bucket compared to what the transition would have cost if GSUPD had built a dispatch center from scratch. “An average 911 center, if you built it out from the ground up would cost you anywhere from $30 [million] to maybe $35 million,” Jennings said. Although the center is operational now, they’re still not done expanding. GSUPD Chief of Police Joseph Spillane said that Phase One has been completed and that Phase Two will begin soon. Phase One involved acquiring new terminals, provided by Motorola, and outfitting an old data center to meet the standards of a dispatch center. Four monitors, currently unoperational but slated to become functioning in the next few weeks, line a wall in front of the dispatchers. They will be linked to camera feeds around the campus, allowing dispatchers to monitor an area if suspicious or criminal activity is reported. “They will use the controllers to basically pull up all of the cameras across the campus. So let’s say somebody calls in and they say, ‘Hey I’m at Petit Science and I see something strange happening down in the Waffle House of Petit Science.’ So now we’re able to pull it up on that wall, all of the cameras along Piedmont corridor, also inside of Petit Science, we’d be able to pull that up,” Jennings said. Once GSUPD finishes Phase Two, the dispatch room will have biometric scanners to prevent nonessential personnel from entering. The terminals that are in use now will also be replaced and used as training terminals as more dispatchers are hired. It will also house a conference room and dedicated office for the 911 communications director. The center works with outside agencies such as the FBI to help catch wanted individuals. 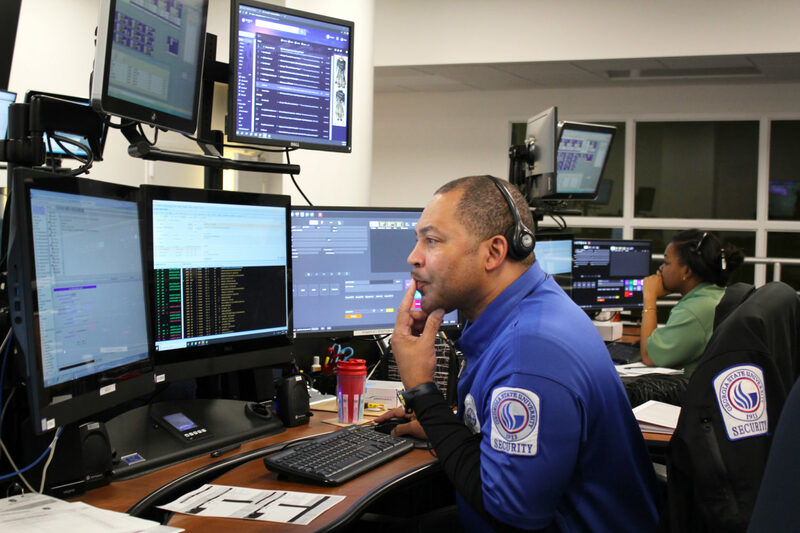 One function of the dispatch center is that it allows GSUPD to send information directly to the FBI’s wanted person system so they can see if a suspect is already wanted by the agency. “We actually ask the FBI, ‘Hey, do a search on this person by name, date of birth, social security number if we have it, and let us know if any agency is looking for that individual.’ And that’s how they respond back to us through the FBI system,” Jennings said. In addition to the FBI’s systems, the dispatch center is also linked to the Atlanta Police Department’s center. In case of an outage at either center, they will be able to transfer personnel to the other one to continue to answer emergency calls. Also, if an individual calls 911 within GSUPD’s jurisdiction, instead of 404-413-3333, they will be transferred from APD’s to GSUPD’s center.